20 cm viii, 152 p. : ill., ports. 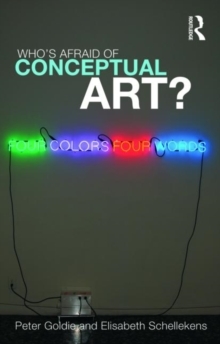 What is conceptual art? Is it really a kind of art in its own right? Is it clever - or too clever?Of all the different art forms it is perhaps conceptual art which at once fascinates and infuriates the most. In this much-needed book Peter Goldie and Elisabeth Schellekens demystify conceptual art using the sharp tools of philosophy. They explain how conceptual art is driven by ideas rather than the manipulation of paint and physical materials; how it challenges the very basis of what we can know about art, as well as our received ideas of beauty; and why conceptual art requires us to rethink concepts fundamental to art and aesthetics, such as artistic interpretation and appreciation. Including helpful illustrations of the work of celebrated conceptual artists from Marcel Duchamp, Joseph Kosuth and Piero Manzoni to Dan Perjovschi and Martin Creed, Who's Afraid of Conceptual Art? is a superb starting point for anyone intrigued but perplexed by conceptual art - and by art in general. It will be particularly helpful to students of philosophy, art and visual studies seeking an introduction not only to conceptual art but fundamental topics in art and aesthetics.